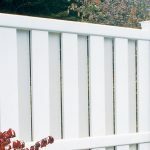 Delta Fence & Construction carries Certainteed’s Buffect line of vinyl fence. With the endless style possibilities of Bufftech, fence becomes so much more than a perimeter, a safeguard, or a dividing line. It also becomes a design element, one that accentuates and beautifies outdoor expanses and special areas. With Bufftech, your creative possibilities are always wide open. We choose Bufftect because of its quality, durability and elegant styles. No matter which style or color you choose, all Bufftech products deliver superior weatherability, enduring color and exceptional strength. Stop by our Outdoor Showroom to see the styles available. Bufftech Select Cedar and CertaGrain textures are created through an exclusive, proprietary process that pulls the grain deeper into the fence panel, creating a grain that better emulates the contours of natural cedar. Other embossed fence products can’t compare! Bufftech is also offered in a smooth finish for the classically clean appearance of freshly painted wood, and CertaStucco providing the beautifully rugged look of fresh stucco. Bufftech offers the greatest selection of textured fence anywhere. The beauty of Bufftech extends far beyond classic white. Choose from a range of solid shades offering the look of stained wood or painted stucco. For a true wood look, Bufftech offers seven multi-chromatic color blends, the most in the industry. These blends are created by dark and light areas that replicate the subtle color variations of natural or stained cedar. Designed to match, contrast or coordinate with your home’s other exterior elements, Bufftech colors are a beautiful extension of CertainTeed’s best-in-the industry line of colorful vinyl siding and accessories.